Can’t go to the UN’s Conference on Climate Change in Copenhagen this December? and learn how you can “Do It Yourself” to help preserve the planet and ourselves. Keep the North Pole from melting! On Thursday, Dec. 3, 2009 from 8:30am-1:30pm, Ventura College students from Gwendolyn Alley’s English composition classes will offer a free “Eco-Fest: A Do It Yourself Day for Action” which they have organized over the last few weeks of the semester. Student presentations encourage cycling, gardening, ocean rescue, and self-empowerment. All are welcome to this free event. Another student group will offer information on how to grow a salad. They will have seeds and soil so participants can begin at the event. An additional student group is concerned about women’s empowerment. In the Fireside Lounge, students will curate a film festival on these themes. Other entertainment includes art, music, handmade crafts and eco-friendly gifts. To encourage participation at the Eco-Fest, Starbucks is donating coffee to those who bring their own cups and Noah’s Bagels will provide bagels. A small donation is requested for cream cheese. From 11:30-1pm, Milano’s is catering healthy pasta and salads for a small donation; samples will be free. What will Santa do if the North Pole melts due to climate change? 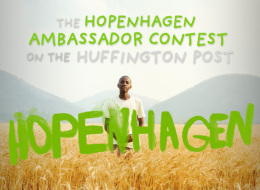 WHAT: Hopenhagen is sending a HuffPost citizen journalist to Copenhagen for the climate conference as the Hopenhagen Ambassador, to represent the global nation of people who are hopeful that leaders will come to an agreement. THE PRIZ E: The winner will receive a trip to Copenhagen from December 12-19th! This will include airfare, accommodation, press accreditation for the UN conference, Media training with HuffPost Citizen journalism editor Mat t Palevsky, HuffPost blogging privileges, and a flip camera to record events . Representing the people of Hopenhagen to the media and at official events throughout the week, reporting on events in blogs and videos posts for HuffPost while in Copenhagen, doing celebrity interviews, and spreading the message of hope throughout his or her personal and social networks. WHO: Anyone over 18 can enter the contest — you just need to upload a one minute campaign video for why you should elected ambassador. click here for the full contest rules. Watch this video for more information on what we’re looking for. WOW!! Should I go for it?? Should you?? Automatic A if you win! & think making a video would be a great project for us all! I’ve been thrilled to see The Wall grow so rapidly over the last few weeks. and share with you why I’m so excited about this campaign. organize others to truly make a difference. that we want to say.That’s what makes The Wall so unique. in a powerful, visual display. for your state or community. in the fight for strong energy and climate policies. I look forward to your message and thank you for being a part of this exciting campaign. so we can check it out! The Ventura College Theatre Department presents the Fall 2009 One-Act Play Festival beginning November 12. This semester’s one-acts include Seven Menus, a transcendental dining experience shared by multiple couples in ever-changing relationships, written by David Ives and directed by Aaron Manuyag; Variations on the Death of Trotsky, an exploration of how the great Leon Trotsky came to have a mountain climber’s axe smashed into his head, written by David Ives and directed by James Fraker; Night Visits, an endearing parable of love, loss, and ultimate happiness, written by Simon Fill and directed by Alex Manriquez; and Misreadings, a unique tale of the delicate and complex relationship between teacher and student, written by Neena Beber and directed by Wayne Hellstrom. The One-Acts will be performed at the Ventura College Mainstage and Circus Theatres continue next weekend: Thursday, November 19 at 8pm, Friday, November 20 and Saturday, November 21 at 8pm, and a Sunday Matinee on November 22 at 3pm. Tickets are $7.00 for general admission, and $5.00 for students, staff, and seniors, and are available only at the door shortly before the performance begins. For more information, contact Judy Garey at 654-6400 ext. 3236 or Jay Varela at ext. 3194. Students enrolled in my classes get in free! Just tell them you’re in my class and your name and they’ll look you up on the roster. I hope you’ll write up a review on your blog–please leave a link here so we can go see! Which is always on a sailor’s horizon. Our every enterprise and steer our course. Where God was given to the world as flesh. Even now it is hard to restrain my tears. We marched in solemn file towards the ships. We should not return for many a long year. Why do you leave me wretched and indigent? That which belongs to me, not you? In the different manner of their years. Rained without ceasing on the white strand. They make the pain of separation worse. Portuguese poet Luis de Camoes (1525-1580) led quite an adventurous life, which included traveling to India and China by ship. His hands-on experience enriches his epic poem The Lusiads about Vasco de Gama on the voyage which ultimately connected Europe to India. He is such an important figure to the Portuguese that his birthday is Portugal Day and his tomb is at the Jeronimos Monastery (pictured–with an actor from a Portuguese Ren era play waiting in the wings!). More to come about and from Camoes! For more poetry, ride the Monday Poetry Train! PS I send my gratitude to Enoforum Wine for the copy of the book from which I quote. I was admiring it in the book store at the monastery and trying to find it on the shelf to buy it when it was quickly purchased for me along with a collection by Fernando Pessoa. Enoforum Wines recognizes that a wine is more than the grapes; it even includes the poetry of the people who make the wine and live on the land. I agree. Thank you!